Attention Active Military, Veterans, and Retirees! GAF – a U.S.-based corporation – is giving back to troops. Receive a $250 rebate off your Lifetime Roofing System* when installed by a GAF Factory-Certified Contractor! Thank you for your sacrifice and your commitment. 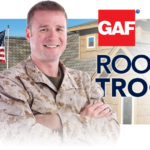 GAF offers a $250 rebate to active U.S. military, veterans and retirees on a GAF Lifetime Roofing System* when installed by a GAF Master Elite® (that’s us!) or Certified Contractor between January 1, 2018 and December 31, 2018. A GAF Lifetime Roofing System includes GAF Lifetime shingles along with at least 3 qualifying GAF accessories. 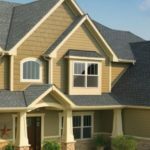 Accessories include underlayment, ice dam and water shield, premium aluminum drip edge, GAF Pro-Start Eave/Rake Starter Strip and GAF Cobra Ridge Vent. Check out this blog for a more detailed description of accessories! To make the rebate even better, we submit all the rebate information for you! Along with a Lifetime roofing system and the $250 rebate, you’ll also get our 10-year workmanship guarantee and the security of working with a GAF consumer protection excellence award winner! *After purchase & mail-in rebate. A GAF Lifetime Roofing System consists of GAF Lifetime Shingles and at least three qualifying GAF accessories. For more information see gaf.com/lifetimeroofingsystem. Also see GAF Shingle & Accessory Ltd. Warranty for complete coverage and restrictions. 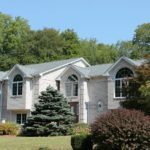 The word “Lifetime” means as long as the original individual owner(s) of a single family detached residence [or the second owner(s) in certain circumstances] owns the property where the shingles and accessories are installed. For owners/structures not meeting above criteria, Lifetime coverage is not applicable. Lifetime Ltd. Warranty on accessories requires the use of at least 3 qualifying GAF accessories and the use of Lifetime shingles. 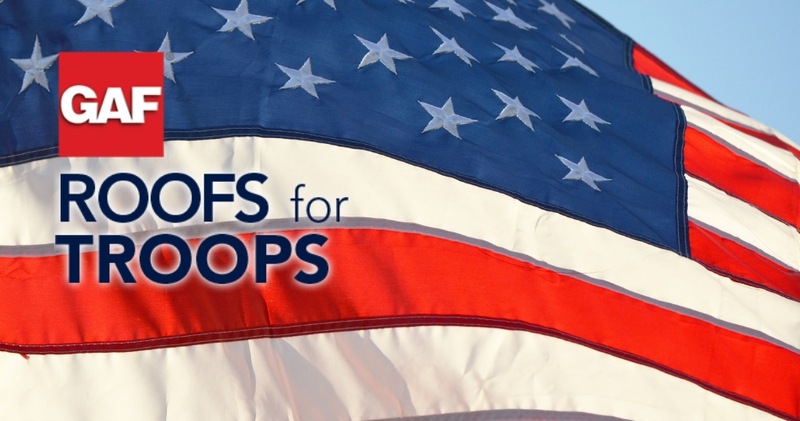 Visit the Roofs For Troops website for more information.